Things went well with Robbie sleeping in his makeshift big boy bed last night. Until about 3:45 in the morning, when he fell the four inches to the floor and woke me up with his sobs. I waited for him to go back to sleep for a little while (to be fair, I didn’t know he had “fallen”) and finally went in to check on him. I found my poor baby face down on the floor, arms stretched above his head. When I came into the room, he just stood up pathetically and sobbed. So, we went. And he fell asleep quickly. Didn’t even fall off the bed. Some nights you just don’t feel like going home. Rainy nights in October, with the first snow of the season threatening to take place. Particularly when the ice pellets are already hitting your windshield. That was me tonight. I didn’t want to come home to a dark, empty house. So, we didn’t. Robbie and I went to Chuck E. Cheese on our way home tonight. It just sounded like the perfect thing for a cold, rainy day: bright lights, pizza, music, prize tickets. And it was. Just what both of us needed on Friday Eve. It didn’t take Robbie long to figure everything out. Tokens, rides, tickets. I sat at the table with the tokens and he ran back and forth, grabbing a token every time his ride was finished. I learned my lesson for successful Chuck E. Cheese adventures, though. Never try to make a child eat there. Save the pizza for the car ride home. After all, there’s only so long a kid has to earn ten tickets for three sheets of stickers. Robbie and I have very different definitions of the word cuddle. I assume it means, well, cuddling. Robbie’s version of cuddling involves burrowing under the covers, slamming his head back on the “pallow” (pillow), and watching some version of toddler crack. So, last night after Robbie’s bath, when he told me he wanted to cuddle, I knew what to expect. After some fast talking about Elmo’s mom making him go to bed, I convinced Robbie that we could cuddle and read a book. In our bed, of course, because cribs just aren’t made for cuddling. After two books, cuddling was finished and it was time for bed. After all, lesson plans aren’t going to write themselves (and, actually, they still haven’t). Robbie, unfortunately, was not going to have any part of staying in his crib. There was screaming, legs thrown over the crib. You know, general mayhem. So, I made and executive decision. Robbie could prove that he was a good boy and go to sleep in our bed. I brought him the requested books, Baby, and Moo. He stayed put for awhile and then, suddenly, I heard a little shuffling. I started up the stairs, saying, “Little boys better be in bed”, and looked up to see him scurry back into our room with his green blanket, claimed from the crib. He played for awhile, quietly, and eventually drifted off to sleep. Until he fell off the bed at 10:25, right before I was heading up to go to sleep. When I went to peel his sobbing body off the floor, my eyes fell on the empty spot on Justin’s side of the bed. I thought I’d smelled something a little minty fresh when I went in the room. And, in the bed, was the evidence. While my darling little by was quietly playing, he found the pack of gum on Justin’s nightstand. He had taken every piece out of the container, licked it, and placed it in the bed. A nice, fresh treat for Justin when he returns from Florida. So, tonight, in an effort to keep my bed to myself and Robbie from the floor, I set his mattress up on the floor outside of his crib. We even bought a pallow for him tonight. He dove into the sheets when I finished making the bed, and, until five minutes ago, I was convinced that this was really going to work. Until I heard footed steps on the stairs and a little voices singing out, “Mama? Happy!” And he was. Until I put him back in his bed and put the baby gate in his doorway. Robbie hates doppers. Hates them. Takes them off every time he gets the chance. And, being the fabulous mother that I am, I use this as a bargaining chip. For example, I may have uttered, “Robbie, if you don’t want to wear a diaper, you need to go peepee on the potty. Then you c an wear Pull-Ups.” Or, “Robbie, if you want to wear Pull-Ups tonight, you are going to need to spit out your gum right now.” And, yes, it works. However, because he is two, Robbie has pronunciation plans. He runs if he sees you coming at him with a dopper. And he squeals in excitement when he sees a “Plup”. Because, you know, that makes him a big boy. And, in breaking news, last night, he didn’t go to the bathroom overnight. So close! Tonight, Zhining called to give me the full story. Robbie ate and ate and ate at lunch today. And, apparently, it went right through him. And his Plup. Those things really aren’t designed for blowouts. After all, it’s cold outside right now. And we don’t have pants-optional Monday. That’s reserved for Sunday with Daddy. Being a resourceful woman, Zhining did the only thing she could do. She put Robbie in striped velour shorts. Except they’re pants. For a nine-month-old little girl. Oy. Motherhood should come with two weeks paid vacation. Time spent alone – or with other moms seeking respite from their own families. The vacation should be covered by husbands who do everything the right way – you know, our way – the entire time we are gone. After all, this is the only way they will ever truly appreciate what we do, right? Although I may not get two weeks paid vacation from mothering (And who would really want two full weeks away? I guess if you could take it in chunks…), I did manage to get a weekend away by myself. In Miami. With a room right on the beach. And do you know what I did? Probably the same thing any one of you would do. I relished in sleeping in my own bed with no one to wake me up in the morning for a diaper change or to go outside (we have a dog, too). I woke up and watched the sun rise (OK, maybe you wouldn’t have done that. But, I had to go to the bathroom and figured I’d check out the view.). I had breakfast by myself (it wasn’t fabulous, but it was free). Perhaps most importantly, I sat by the pool in the sun and read for 6.5 hours. I ventured down to the beach a few times and stuck my feet in. I swam in the pool. I had a drink. Eventually, I made my way inside and got dressed for a run. It wasn’t long – just a mile and a half up the road. Then I walked back through the water on the beach. I finished the day by getting my nails done and taking myself out for a nice dinner. It was the perfect day. Sunday really started off, well, in a bizarre way. I had a massage scheduled. The massage therapist wasn’t there, so they told me to sit in the sauna. Which I did. For twenty minutes. And then the lady came in. She had me take a shower and lie down on the portable massage table. In the middle of the locker room. With all the lights on. And the bass pumping in from the gym. Oh, and she wore plastic gloves. You cannot make this stuff up. I only booked it because I had a 50% off coupon from Living Social. The fitness center told me the massage was $100, which, by my calculations, should have been $50. It was $60. Don’t you know? The woman raises her price to $110 for Living Social clients. Which, if you’ve kept up, is still baffling. Because, yes, 50% of $110 is $55, not $60. I’m still working on that one. I managed to get three hours by the pool in before I had to leave for the airport and return to reality. But the beauty of it was that I was ready. I wanted to come home to my little boy. I would have liked to come home to my doting husband, but he was off for a week of travel before I got home. Now, did he do everything the way I would have? Absolutely not. But, everyone was alive when I got back. So, pants-optional Sunday, CapriSuns, and man-time be what it may, I’m glad they got the time together. And I’m glad I got my time alone. I can appreciate what I have so much more now that I’m in my right mind to appreciate it all. Robbie had been calling my name for at least fifteen minutes when I finally went upstairs to investigate. After all, I am trying to get packed for my solo trip to Miami tomorrow and leave the house reasonably clean for Justin and take a shower and, at some point, eat dinner. You could imagine my surprise when I got to the top of the stairs and saw Robbie’s diaper, pajama top, and pajama bottom littering the floor. I went into his bedroom to find my darling child buck naked, holding himself, dancing, and crying, “QiQi peepee potty, Mama!” His voice grew increasingly panicked as he repeated himself. Not wanting to risk missing the toilet, I grabbed the naked toddler and ran downstairs. He flew threw the bathroom, right to the toilet. Where he sat for the next fifteen minutes. I read him a book. He played with toy binoculars. He ran water in the sink. And then he did it. He used the potty! I know… He’s done it before. It’s the next part that you’re really going to like. He told me he had to go again. Now, I know how the body works. Once you’ve gone, you’re good for a while. So, I tried to impart this wisdom on Robbie. Well, the best I could to a two-year-old. I dressed him in his Pull-Ups (since he’s refusing to wear diapers to bed as of tonight – he tore his off three times) and red moose pajamas, set the tent back up in his crib, and put him to bed. I ventured back downstairs to finish packing and, hopefully, eat dinner. Five minutes later, there were panicked cries coming from Robbie’s room again. After trying to assure him that he did not have to use the potty again, I went upstairs to find him stripped down once again. In order to ease his mind, I took him to the bathroom again. And. He. Actually. Had. To. Go. Again. And so I taught Robbie to say, “I know my body!” Because he does. I walked back in the kitchen to find the dishwasher open and the bottom rack pulled out and off it’s tracks. Robbie was standing in the middle of the kitchen, holding the package of dishwashing detergent packets. He looked up, surprised to see me back so soon, and said, “Dishes, dirty.” Of course! And how in the world could I find anything to be frustrated with when all he wanted to do was wash my dishes? He had even pulled some of his (clean) dishes out from the cabinet to put in the dishwasher. The cleaning help continued when we found a mess Barkley made in the hall (picture a dog afraid of an iron left in the middle of the hallway who feels a need to mark it). He came running in with extra paper towels and declared Barkley a “bad dog, messy.” It was all I could do to not scoop him up. Robbie’s also turning into quite the workout buddy, too. This afternoon, he laid down next to me to do sit ups, giggling as he tried to keep up with my counting. When he saw that I was using an exercise ball (you know, the exercise where you move the ball from between your legs to your arms while doing sit-ups — terrible description, but you get the picture), he got up, ran to the play area, got a softball, and tried to imitate me. As I finished ab work (I know they’re in there somewhere! ), he pounced on me (resulting in a massive tickle fight where he repeated “I will not jump on my beautiful mother” while trying to catch his breath) and later brought me hand weights (8 pounds, nonetheless). As I moved toward a little arm work, he grabbed one pound weights and followed along. Maybe he’s gotten so into fitness since we started doing our stroller runs together. Whatever the reason, I like having someone remind me that we need to go to the gym (he starts telling me “QiQi, gym. Fun” as soon as he gets in the car) and doing exercises with me. It’s nice to have the support in person. Lately, Robbie has started taking over prayers on his own. He repeats what I say for the first part and then goes into his list of blessings. Tonight it went a little something like this: “God bless Grover (the cat closest). Okar. Barkley. Ish. Okar. Ish. Cookie. Elmo. QiQi. Mama. Daddy. Nona. Pops. Hal-a-ree. Hunter. Papa. ‘Ma. Jarrod. ‘Netta. ‘Men.” He usually corrects me when I ask God to bless Robbie by throwing in a “QiQi”. It started with Robbie’s second hair cut. I held off as long as I could, given the disaster of the first one, but it was time. 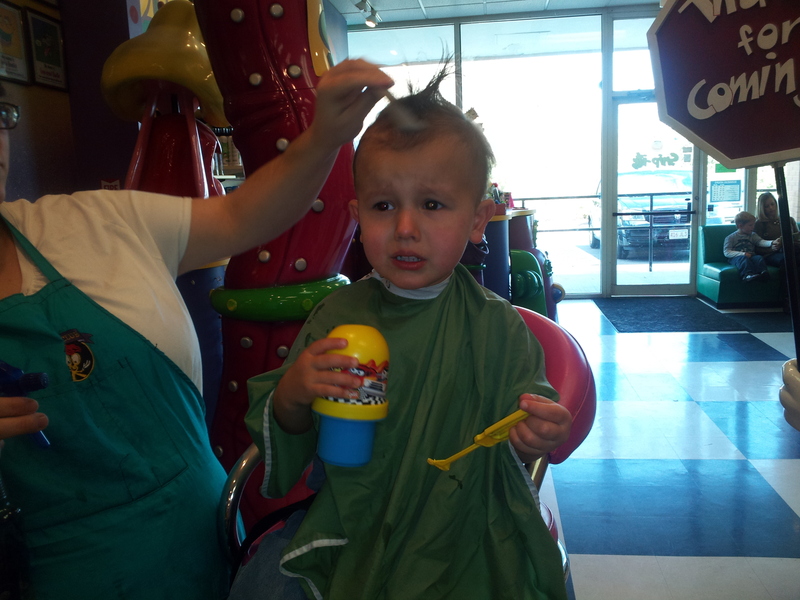 Today, we ventured to Snip Its, which specializes in children’s cuts. 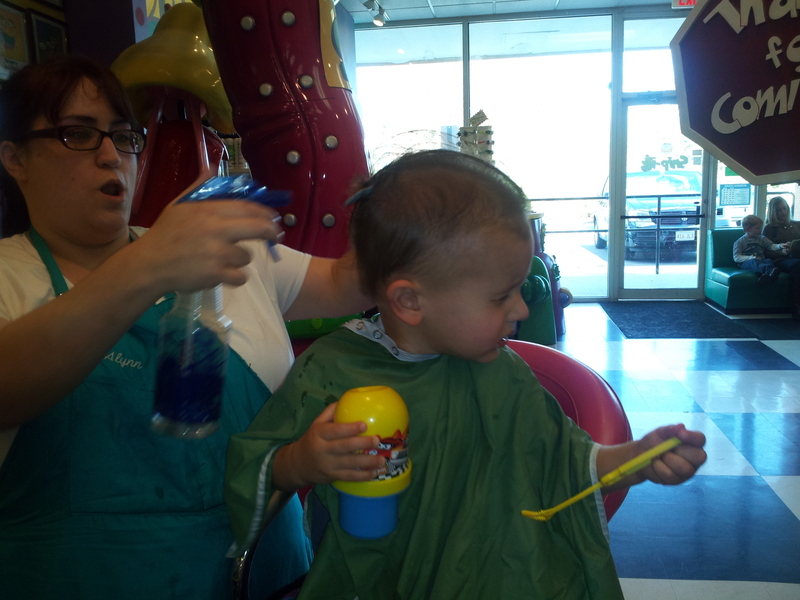 I hoped that would handle it with a little more class than his first haircut, especially because she gave him bubbles and put his hair into a mohawk. Our fun-filled evening continued with a dinner out. It involved broken crayons, thrown bread, and a bumped head as Robbie was crawling under the table to get back to me. You know, pretty much the usual. We really hit full speed at bed time. Robbie smashed his fingers in the dresser drawer while trying to get his Smurf shirt. This is after he took off his ‘Ickey Mouse shirt and brought me my dirty Kentucky shirt to put on him. But, I digress. The poor child never quite recovered from smashing his fingers. 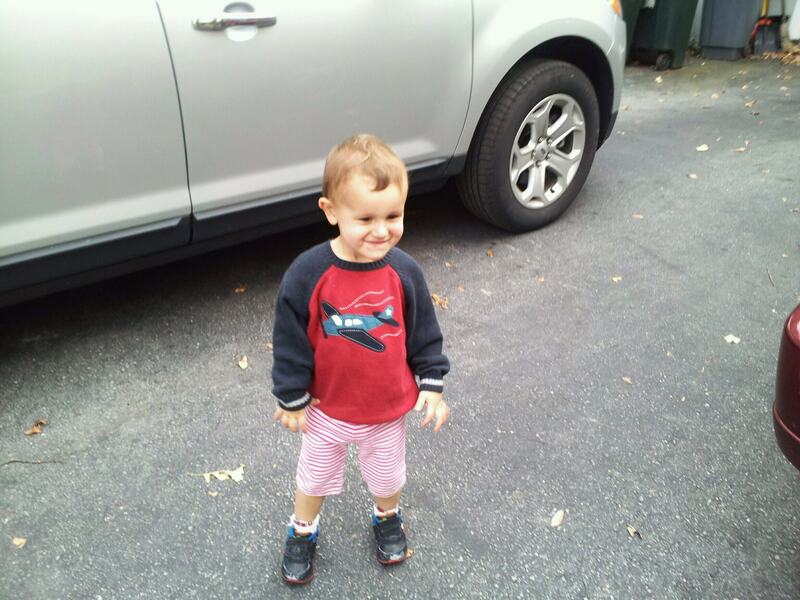 In fact, he screamed his way through bath time and, when Justin tried to get him dressed for bed, insisted on wearing his Smurf shirt, khakis, socks, and running shoes two sizes two big. The screaming and crying continues for the next hour and only stopped when Robbie finally confided in me that he was thirsty. For those of you not new to parenting, you will recognize this as an excuse to escape the bedroom and look for reinforcements. Which is primarily what Robbie did – he headed straight to Justin and asked for Elmo. Justin scooted over on the couch and let him climb up. Our Saturday started at 7:00 this morning when the alarm went off. We managed to be out of the house by 7:35, despite a full-blown temper tantrum from Robbie that ended with him grabbing a Go Cats shirt from the laundry hamper – complete with a hole in the arm pit – and going to the car without shoes or socks on. Eventually, we got him wrangled into shoes, socks, and a sweatshirt, and we were headed to Boston College to run the Red Bandanna Run (redbandannarun.com – you should really check out the story behind the race; it’s inspiring). This was our first race with a jogging stroller. One I picked up last night, actually, since we didn’t have a sitter this morning. The $67 investment should pay for itself in two races, and, if I get Justin to push it, it doesn’t impact my time at all. As soon as we got started with the race, Robbie looked up and said, “Mama, QiQi run!” I think this was the first race that Justin and I actually ran together – from start to finish. No one tried to outdo the other. It was our first real family run. And we finished in 35 minutes, only 30 seconds off my best time. Who knew I just needed to make Justin push a stroller to slow him down to my time? We stopped for coffee after our run and evaluated our choices for the day. Since it was so gorgeous, we decided the day called for a little yard work. Two days of downpours left a lot of leaves in our yard, and our back door needed a second coat of paint. Between the three of us, we finished the work in less than an hour. Yes, the three of us. On our way home, we stopped by the hardware store to pick up some supplies. At the checkout, I found a child’s rake. Having experienced yard work with Robbie, I know it’s best if he has his own tools. Trust me. It was $9.99 very well spent. For the most part. Much to the surprise of my two boys, I planned to do the front yard, too. Robbie was happy cruise up and down the sidewalk in his Cozy Coupe (a side-of-the-road find a few months ago). While he was playing, I thought I would use his little rake to get under the mums and between the day lilies and spider wort. But I was not slick enough. Robbie spied my illicit rake use within fifteen seconds (perhaps because Justin shouted, “Here, Mommy. You can use Robbie’s rake!”) and came running. He grabbed it from my hands, said, “QiQi rake, Mama”, and took off toward the backyard. Eventually, he came back, used it for a few seconds, and then dropped it again. Not having learned my lesson, I tried for the rake again only to get the same result. 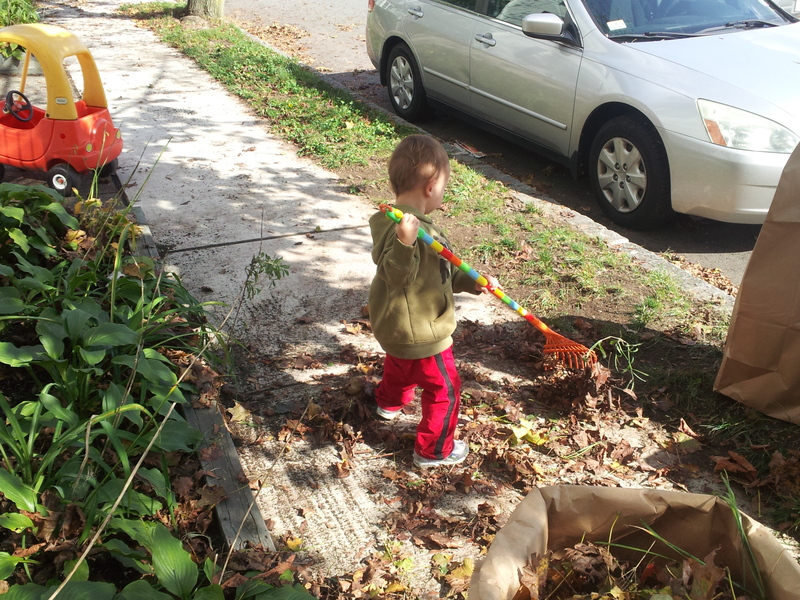 He did, however, eventually do a little more raking and put some of the leaves in the bag. Robbie decided it would be permissible for me to use his broom, which he kindly brought to me. Unfortunately, it was not what I needed. Later in the day, after everyone’s afternoon nap, we got dressed to run errands. Robbie saw that I was wearing a UK shirt (with crying Louisville fans on the back) and insisted he be outfitted in Go Cats gear. After he got dressed, Justin came upstairs to check on our progress. Robbie took one look at his father and could barely contain his disgust. 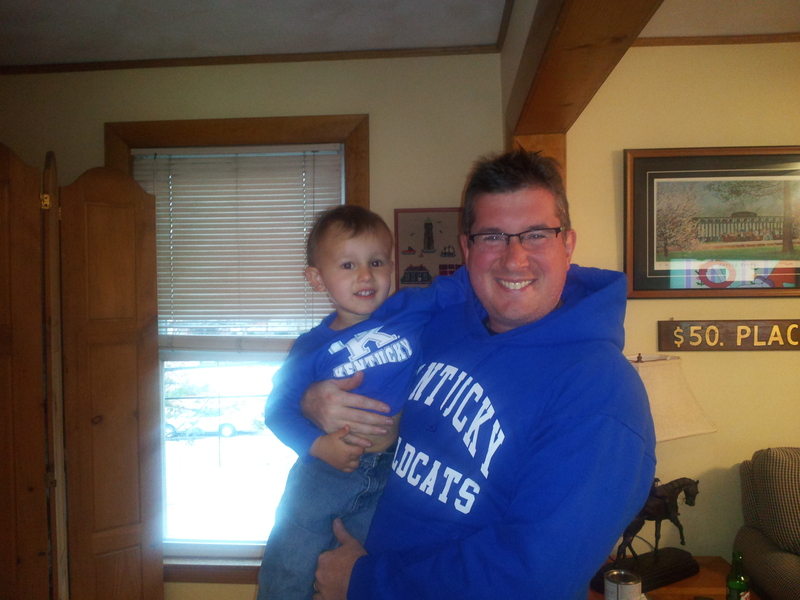 He marched over to Justin, pointed at Justin’s shirt, and said, “Daddy, Go Cats shirt. Daddy, shirt. Cats.” And what was Justin supposed to do? He went and changed clothes and we looked like “that” family in the coordinating outfits for the evening. It’s been a perfect family Saturday, so I should be ecstatic, right? And, on many levels, I am. However, there’s a little bit about it all that makes me sad. Because having a toddler big enough to help with yard work, ask to watch Cats Ball, and convince everyone to change clothes to support his favorite team means that he isn’t a baby anymore.